New York Rangers President and General Manager Glen Sather, along with Director of Player Personnel, Gordie Clark, oversaw the club’s activity in the 2011 NHL Entry Draft on Friday, June 24 and Saturday, June 25 at Xcel Energy Center in St. Paul, Minnesota. The club, which held six picks in the draft, selected four forwards and two defensemen. 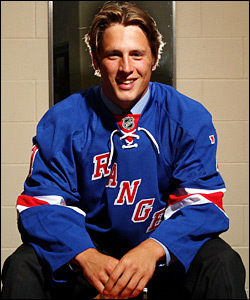 The Rangers began the draft Friday by selecting forward J.T. Miller with the 15th overall pick. The 6-1, 200-pounder led Team USA in scoring with 13 points in six tournament contests en route to capturing the gold medal at the 2011 IIHF U-18 World Junior Championship in Germany. He was selected by tournament coaches as Team USA’s top player during the elite tournament after leading Team USA in points and assists (nine), and finishing second on the team in goals (four) and plus/minus rating (plus-eight). Miller skated in 48 games with the U.S. National Under-18 Team (USHL) last season, registering 11 goals and 26 assists for 37 points, along with 80 penalty minutes. J.T. Miller, the Rangers' first-round pick at No. 15 overall in the 2011 NHL Entry Draft, was one of four forwards selected over the weekend in Minnesota. Miller established USHL career-highs in games played, assists, points, and penalty minutes, and ranked third on the team in points, and second in assists and penalty minutes. The East Palestine, Ohio native entered the 2011 NHL Entry Draft as the third-highest ranked U.S.-born skater and 23rd overall among North American skaters in the final Central Scouting Rankings. The second day of the draft began with a trade for New York, sending forward Evgeny Grachev to St. Louis in exchange for a third round choice (72nd overall). The Rangers selected Edina Hornets (High-MN) forward Steven Fogarty with the pick. Fogarty led the Hornets with career-highs in goals (23), points (40), plus/minus rating (plus-14), game-winning goals (four), and shorthanded goals (two), tied for second with a career-high in assists (17), and third in power play goals (three). He recorded a career-high, nine multi-point performances, including three hat tricks. He notched a career-high, four goals, and added two assists to tie his career-high with six points on January 27 vs. Hopkins. The Chambersburg, Pennsylvania native also led the Hornets with 11 points (three goals, eight assists) in six playoff games en route to a fourth-place finish in the High-MN Class AA State Tournament. In the fourth round at the 106th position, the Rangers tabbed Winnipeg, Manitoba native Michael St. Croix from the WHL’s Edmonton Oil Kings. St. Croix established career-highs in games played (68), goals (27), assists (48), points (75), power play goals (nine), penalty minutes (48), and plus/minus rating (plus-28) last season. He led the Oil Kings in assists, ranked second in points and power play goals, and third in goals and plus/minus rating. The 5-11, 179-pounder was ranked as high as 36th overall among North American skaters in the Central Scouting midterm rankings. The Blueshirts held a pair of picks in the fifth round, selecting forward Shane McColgan with the 134th overall choice and defenseman Samuel Noreau with the 136th overall selection. McColgan registered 21 goals and 45 assists for 66 points, along with 62 penalty minutes in 67 games with the Kelowna Rockets (WHL) last season. He led Kelowna in points, ranked second in assists and fifth in goals. Noreau tallied 10 points (five goals, five assists) and 141 penalty minutes in 67 games with Baie-Comeau Drakkar (QMJHL) last season. The 6-5, 215-pounder ranked seventh in the league and second on Baie-Comeau in penalty minutes. New York closed out their 2011 draft by selecting Trencin Jr. (Slovakia-JR.) defenseman Peter Ceresnak in the sixth round (172nd overall). The Rangers acquired the pick earlier in the day from the Nashville Predators in exchange for a sixth round selection in the 2012 NHL Entry Draft. Overall, the Rangers selected four forwards and two defensemen, three from Canadian junior hockey leagues, two from U.S. hockey leagues and one from a European hockey league, and three Americans, two Canadians and one European. The average weight of the Rangers draft picks was 195 pounds, while the average height of the 2011 New York draft class was 6’1”.